Micallef P(r)ogram(me) – Shaun Micallef Online! The ABC series “Shock Horror Aunty” has aired over the last few weeks, looking at ABC TV’s most shocking moments. The last episode concentrated on those who dared take on society’s sacred cows, and the Micallef P(r)ogram(me) was noted for two sketches: Wayne’s character’s statue of the horrors of war, complete with erections; and the documentary of Weary Dunlop: Transexual. The ironic part about the Weary Dunlop sketch is that it was never aired because of the media backlash over the very thought of it, however the sketch itself actually only went for 10 seconds before it was designed to cut away to a complaints desk – mocking the exact scenario that actually happened! 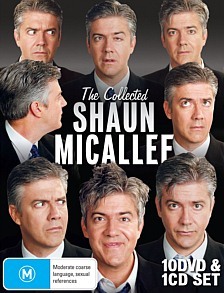 After rumours last year, finally The Collected Shaun Micallef DVD Box Set is now out in stores (also here)! Originally, the box set was to include Shaun Micallef’s New Years Rave, shown on Channel Ten at the end of 2009, but that seems to have been omitted. That means all of the DVDs (and CD) in the box have been previously released individually. Another glaring omission is of course Welcher and Welcher, which was released last year. This weekend, the Sydney Symphony is performing the music of US composer John Williams, and Shaun will be presenting it – although he promises to be ”sitting very quietly on a stool”. John Williams is perhaps best known for composing the score for the Star Wars films, which earned him one of his five Oscars, as well as Jaws, the Harry Potter movies and Jurassic Park. In an article with The Age/SMH, Shaun also admits he is an “acquired taste” (which makes it all the more better), always changing roles or scripts to suit himself; and reveals that the favourite of his TV show themes is “The Micallef Programme” (which makes a great ringtone).